Historians account 162 thousand Terek Cossacks residing in their Stanitsas by the end of 1894. Their population grew to 255 thousand by the end of 1916. On March 27th, 1920, the first acts of genocide against Terek On this day, March 27th, 1920, approximately 70 thousand Cossacks were repressed of their national identity, and were taken as prisoners from their home Stanitsas and were to be transferred to a secure Bolshevik camp for their fates to be decided. On the way to the train, the Bolsheviks spared no one, not even the children. It is said that the road was a massive graveyard, people with dismembered limbs lay on the side. Once at the train, they were stuffed inside like raw materials, and those who were unable to find room to board the train were shot. Their lives forever lost, and beyond recognition, their history seems to be forever lost. Their lands became occupied, and their treasures stolen. The Cossack identity was no longer safe, not even to those who sided with the enemies. During the 1900s, 70% of the Cossack population was destroyed, yet today we hear stories that the Cossack genocide never occurred. Our People are not given the proper recognition in certain Countries, and the historical importance of this day remains quiet. We can not let those who laid down their life on this day, go unremembered. 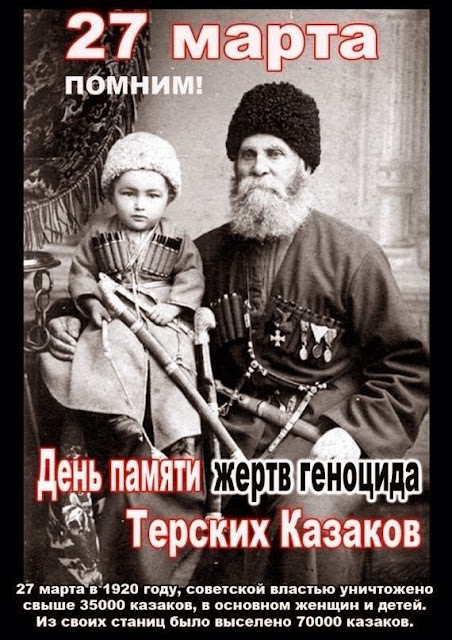 Eternal Memory to all Terek Cossacks whose lives were lost during the Terek Cossack Genocide.